They are also excellent climbers. They can climb over the fence in the case they can't dig underneath it. Armadillos are small mammals with a shell of armored plates that protect them from predators. From one egg, 4 identical armadillos will be born. They are called quadruplets. There are 20 species of armadillo. Only one armadillo species (nine-banded armadillo) lives in North America. Other 19 types live in South America. The lifespan of an armadillo ranges from 4 to 30 years. Armadillos live in temperate and warm habitats, including rain forests, grasslands, and semi-deserts. Armadillos are great swimmers. They can hold their breath for 6 minutes when they dive. They vary widely in size and color. Armadillos can be pinkish, dark-brown, black, red, gray or yellowish in color. The giant armadillo (Priodontes maximus) is the largest of the armadillo species and can reach up to 150 centimeters (59 inches) including tail and weigh up to 54 kilograms (119 pounds). They have poor eyesight and use well developed sense of smell to find their prey. The pink fairy armadillo (Chlamyphorus truncatus) or pichiciego is the smallest species of armadillo, at 85 grams (3.0 ounces) and 13 to 15 centimeters (5.1–5.9 inches) in total length. Like anteaters, they have long sticky tongue that works perfectly when they hunt ants and termites. They eat fire ants also. Closely related to anteaters and sloths, armadillos generally have a pointy or shovel-shaped snout and small eyes. Their whole body (head, back, legs and tail) is covered with bony plates. Contrary to popular belief, not all armadillos are able to encase themselves in their shells. In fact, only the three-banded armadillo can, curling its head and back feet and contorting its shell into a hard ball that confounds would-be predators. Armadillos also dig ground to find their favorite food - insects. Beside insects, they like to eat small mammals, baby birds, eggs, carrion, roots and fruit. Although most armadillo species look like they are bald, they do have wiry hairs on the sides and the belly. Some people refer to the hairs as curb feelers, since armadillos can feel their way around an area at night as the hairs touch objects. Armadillos have very poor eyesight, and use their keen sense of smell to hunt for food. Armadillos have strong legs and sharp claws. They use their claws for digging and finding food, as well as for making their homes in burrows. Armadillos are solitary most of the time and spend most of their time sleeping. They usually sleep up to 16 hours each day in burrows. They sleep 16-18 hours per day in their burrows. Armadillos are mainly nocturnal, however they may also occasionally appear during the daylight and may be diurnal in cool weather. Armadillos are insectivores. Although most of their diet consists of insects and invertebrates, armadillos also eat fruit, eggs, and small animals. They even eat carrion. Their legs and long claws are perfectly adapted for digging. They can dig and create network of tunnels underground. Like anteaters, they have long sticky tongue that works perfectly when they hunt ants and termites. Armadillos live 4-7 years in the wild and 12-15 years in captivity. Only three-banded armadillo can curl into the ball to protect itself from predators. Other armadillos run or dig a hole when they need to escape from predators. They are also excellent climbers. They can climb over the fence in the case they can’t dig underneath it. Armadillos have little body fat and thin shells, so they cannot maintain their internal temperature as most mammals do. Usually, the only time armadillos get together is to mate or to keep warm. During cold times, a group of armadillos may hunker down in a burrow together to share body heat. Breeding season for armadillos varies from species to species, but there are some armadillos that can reproduce year-round. Gestation is anywhere from 2 to 5 months. Armadillos do not form bonds, and the father does not stay to help raise the young. A baby armadillo is called a pup. Armadillos can have from 1 to 12 pups in a litter. When the pups are born, their shell is soft and gray and feels like leather. They can roll up into a ball within hours of being born. The shell hardens within a few days. Pups mature quickly. They are weaned by 2 to 4 months. By nine to 12 months, the pups are mature and ready to have offspring of their own. Armadillos have many predators including coyotes, lynx, wolves, raccoons, pumas, bears, and some of the larger hawks and other birds of prey. 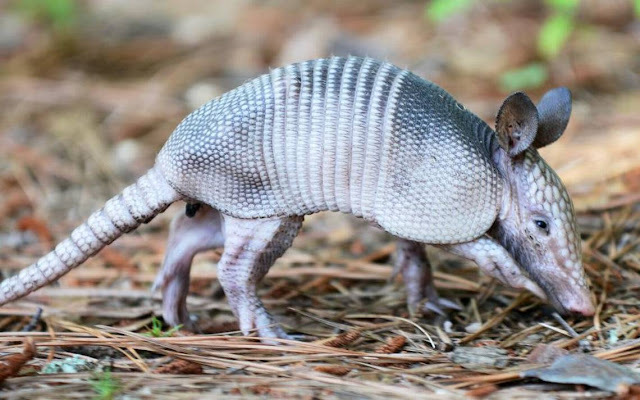 Some people in Mexico, Central America and South America also eat armadillos, whose meat is sometimes used as a substitute for pork. Most armadillo species are threatened because of habitat loss and hunting. The word armadillo means “little armoured one” in Spanish. They vary in size, from 5-59 inches in length to 3-120 pounds in weight. The Aztecs called them āyōtōchtli – “turtle-rabbit“: āyōtl (turtle) and tōchtli (rabbit). The nine-banded armadillo is the official state animal of Texas. Armadillo shells have traditionally been used to make the back of the charango, an Andean lute instrument. Armadillo shells are so strong that two people have been reported as being injured by bullets ricocheting off armadillos’ shells. The pattern on the head plate of an armadillo is unique to each individual. Reproduction of armadillos is very unique. Although mating season takes place in July, female becomes pregnant in November. This is called "delayed implantation". Female can postpone her pregnancy until environmental conditions become satisfying. The number of armored bands identifies the different species. The glyptodon was a prehistoric armadillo as big as a Volkswagen Beetle! Baby armadillo is born without bony plates. It takes few weeks for soft skin to turn into hard armor.